How to get people to not sit on your bench, Finglas. FFS! Give the old folk a plain green traditional bench to sit on. 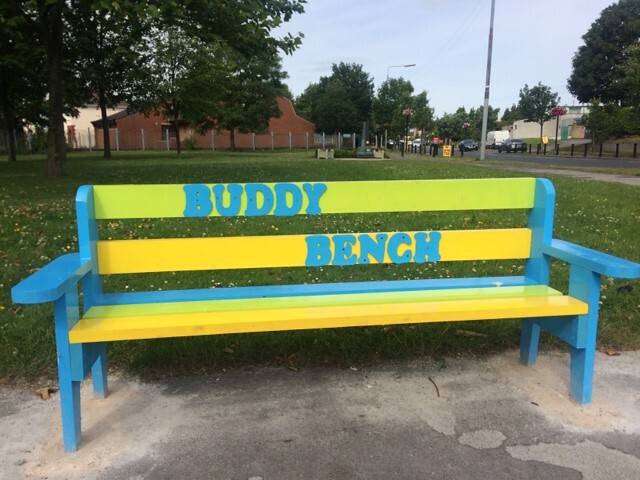 Don't embarrass them away by calling it a bleeden "Buddy Bench". Hurry while stocks last. 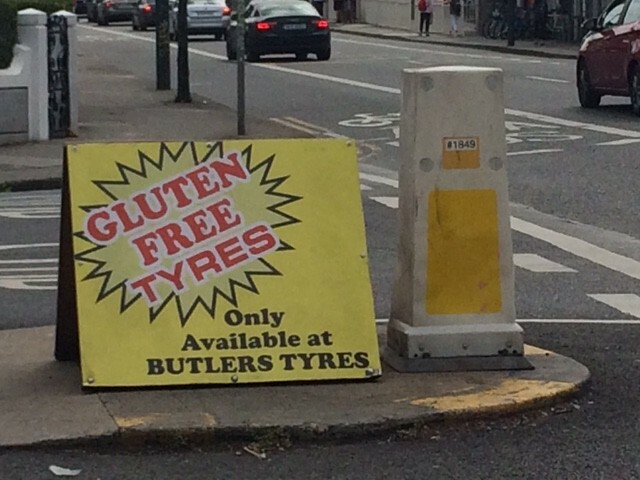 Great add by Butlers Tyres Harold's Cross. It's a REAL GHOST! 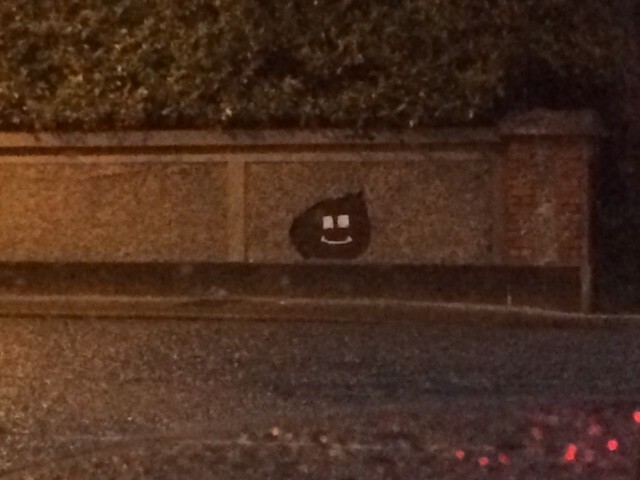 But this one looks friendly, Dartry Rd. 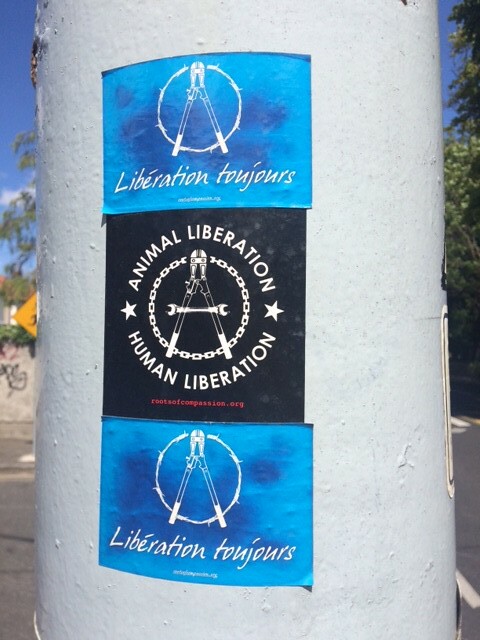 Animal Liberation / Human Liberation, near Bushy Park. Until recently I thought the single crease across the palm was just a curiosity. Like my ability to wriggle my ears, together or one at a time. That was until it was mentioned in a book I was reading ("I am Pilgrim" by Terry Hays. Don't bother, its not that good). It seems it is a fusion of the head and heart line and is used as a diagnostic tool to identify babys with various syndromes including Downs Syndrome. It is commonly associated with such syndromes but is very unusual otherwise, and I venture to say it is even more rarer in the ear waggling community. 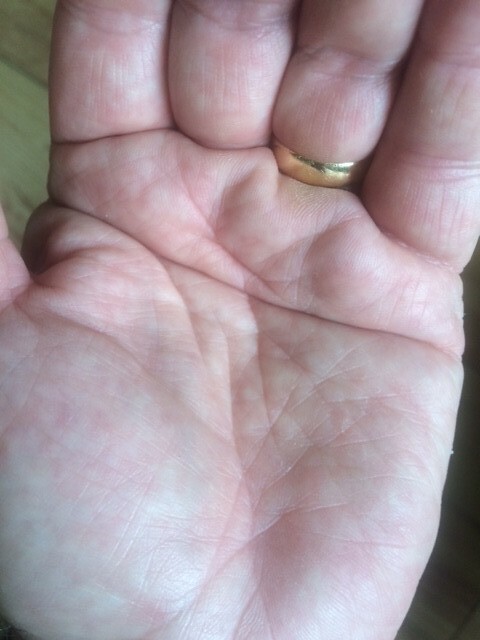 It is called a Simian Crease and is so called because all Monkey, Chimpanzee and Apes hands have that crease, a fact which my better half says "explains a lot", whatever that is supposed to mean! I am sure you are dying to hear more about my ear-waggling talent. Well my most memorable performance was over 30 years ago now. My soon to be better half and I were in a Gaelic speaking music playing group of her friends, and being neither Gaelic speaking or music playing I was beginning to feel somewhat inadequate. I suppose it must have been the Guinness that made me think that what was needed to make the evening complete was a display of ear waggling complimented by my minor talents of eyebrow raising (think of Spock on speed) lip curling and a challenge to the stunned gathering to " lets see ya best that"! Luckily our relationship survived and after I promised never to unveil any other hidden talents without first checking with her she did admit my display was impressive in a surreal sort of way. Well I think that is more than enough for now........but I bet by now you have all checked your palms and tried to wriggle your ears. It seems photo hosting sites are getting fed up with people using their free services. Photobucket sent me a message saying I had to pay to continue using them. The reason given was that I was had used them too often for posting on message boards, as I don't post anywhere else that must mean here. Flickr have also stopped me uploading pics to my most used account. The pics below are from a different, not used much, account. I wonder is it part of the clamp-down on free speech on the web. Google leads the way and others follow. Mind you, it did surprise me that companies would let you use them without paying them. Seems the wild west days of the web might be coming to an end. It is a mock-up of a traditional phone box and is as out of place as Bill Clinton in a convent. 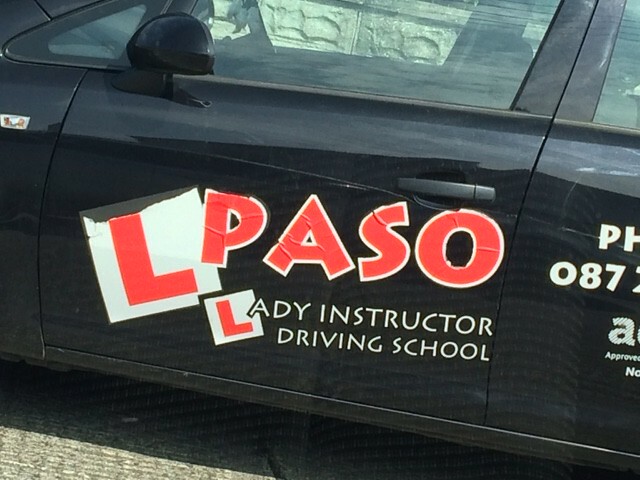 It was well made to be fair, just in the wrong place. It was an imitation of a Japanese "Wind phone" which an old retired Gardner had built in his garden. If he had the lack of common sense displayed by the Irish Wind phone builders he would have stuck it half way up Mount Fuji. It was the work of a group of artists called Altrúchas who claimed it was a work of art. Altrúchas were threatening that the ludicrous thing would be a permanent feature. That they would maintain it. 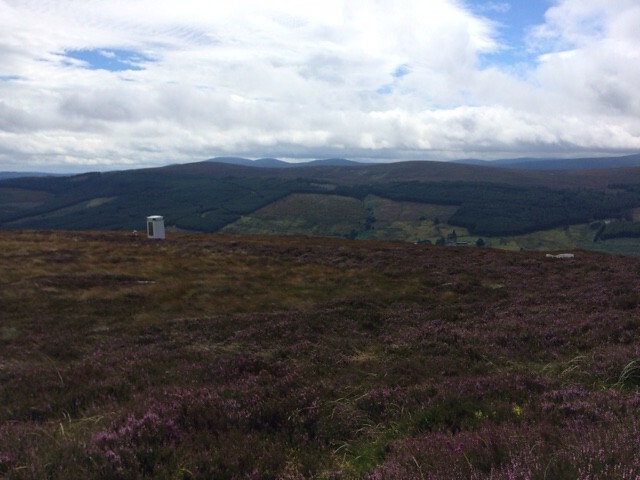 This would have resulted in disruption to the Red Grouse which is "red-listed" by bird watch Ireland due to significant declines and who nest on the ground in the vicinity. 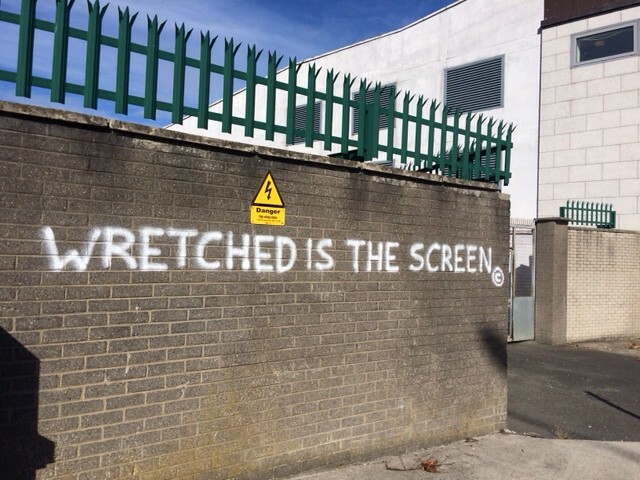 Fortunately an anonymous group of art critics delivered a devastating review. 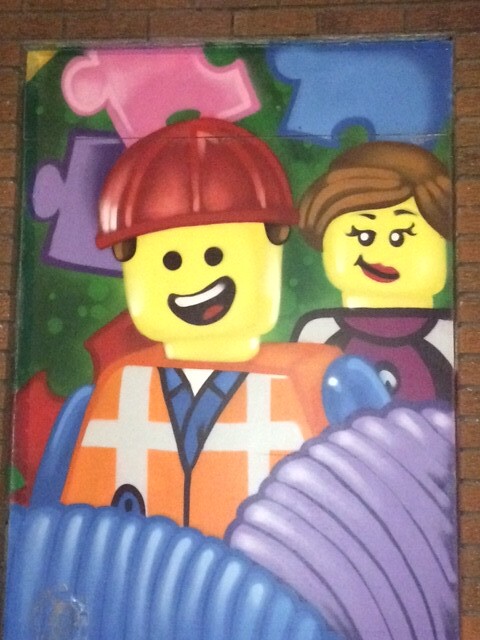 Their deconstruction of the art work resulted in its removal. 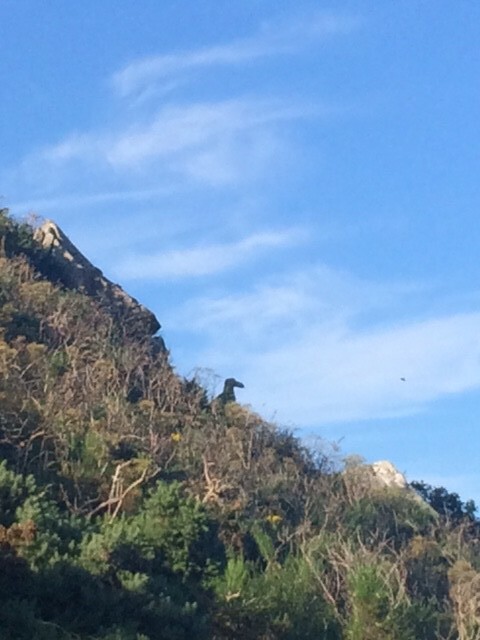 This eagle is carved out of the rock high above the Vico road in Killiney, Dublin. 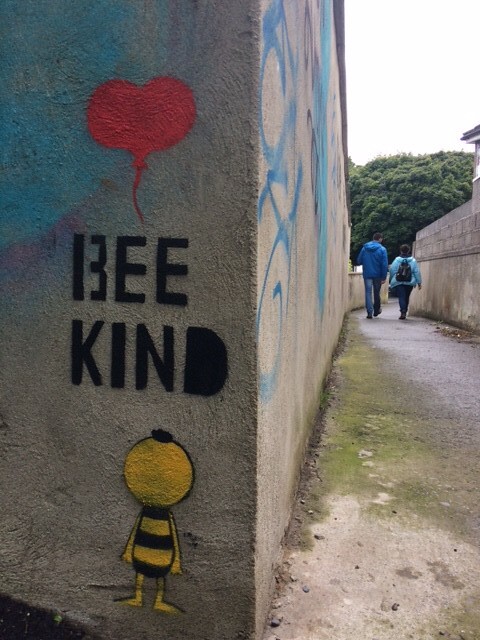 Most people who walk around Killiney don't even notice it. 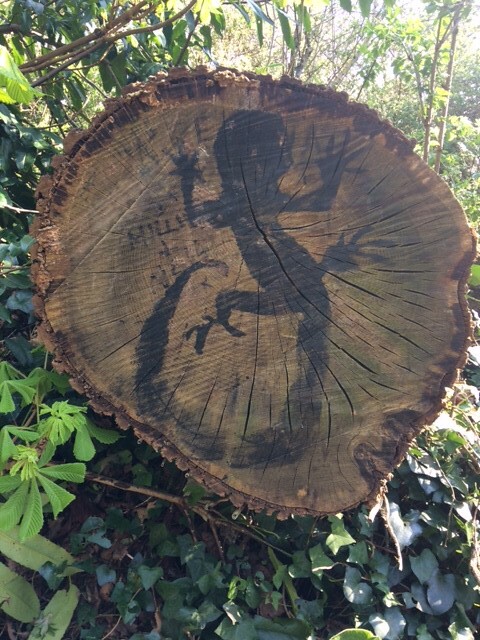 It has been there for well over a hundred years, why it was carved no one seems to know. 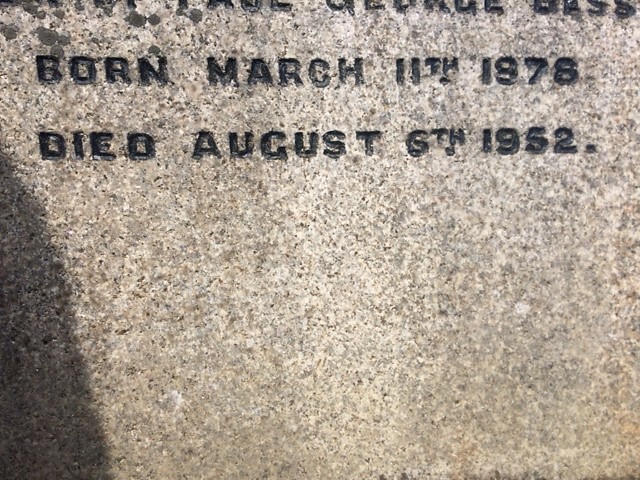 My theory is that it was a work of art by some of the stone-masons who came to the area to work building the harbors. 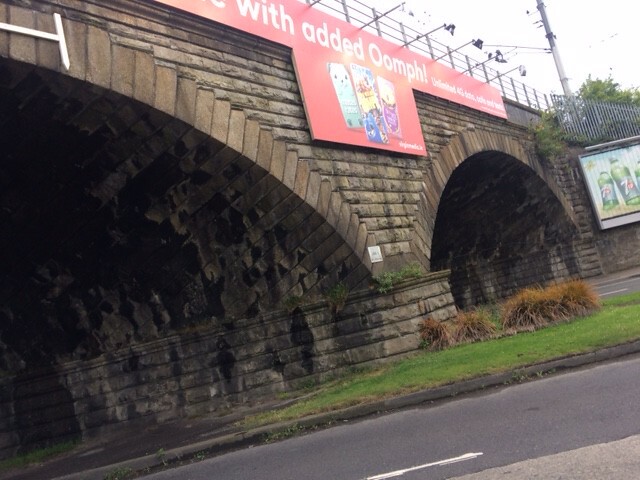 The Railway Bridge on Clontarf Road should not be used for hanging advertisements from. It is an example of great stone work. The skill and craftsmanship which went into building the bridge should be highlighted. At night it should be flood-lit and information displayed about the bridge, its construction, and other notable buildings in the area. That is what many visitors want to learn about and they could also be informed about Bram Stoker who lived nearby. Hi dedogs, I don't know who took the phone box thing apart but I doubt that it was vandalism. 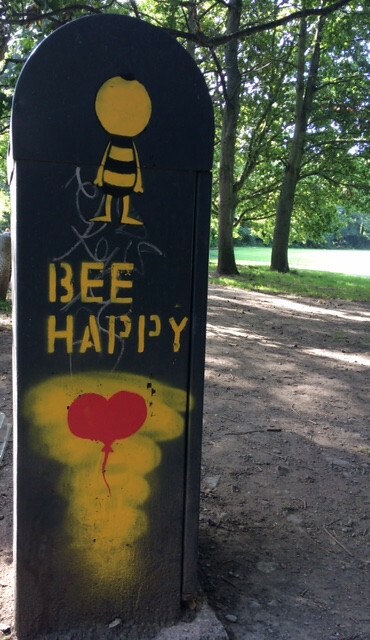 My best guess is that it was removed officially by the Dublin Mountain Rangers who, more than the average person would appreciate the damage an attraction plonked in the middle of a sloping heather-meadow would cause. Many new trails would be opened up, the rare ground nesting birds and other wildlife driven out or killed and plant cover destroyed with the resulting soil erosion. The positioning of this instillation was not thought through. Altrúchas say they have the remnants of the box and are considering placing it somewhere else. Before going on another solo run I suggest they use their web site to ask for suggestions and have a debate about the pros and cons of any suggestion. That is how to avoid blunders like we have just seen. Here is a letter of mine the Irish Times published. It gives a bit more information and history about the Wind Phone. 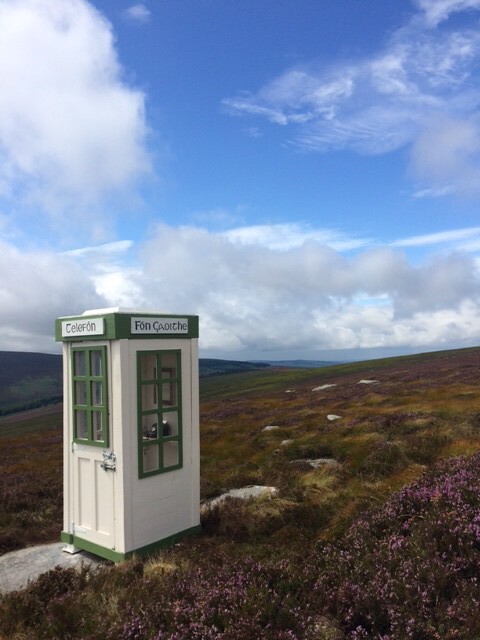 A few days ago an anonymous group of Irish people called Altrúchas set out to imitate the Japanese wind phone and in what must have looked like a scene from a Father Ted show carried a generator, fuel, drills, planks, paint, tools, and everything else needed to build a mock-up of a phone box up the heretofore unspoiled heather coated slopes of Two Rock mountain. Could be a good idea, but I don't think we will even consider it. The Dunlaoghaire-Hollyhead ferry sailed for 204 years up until 2015. 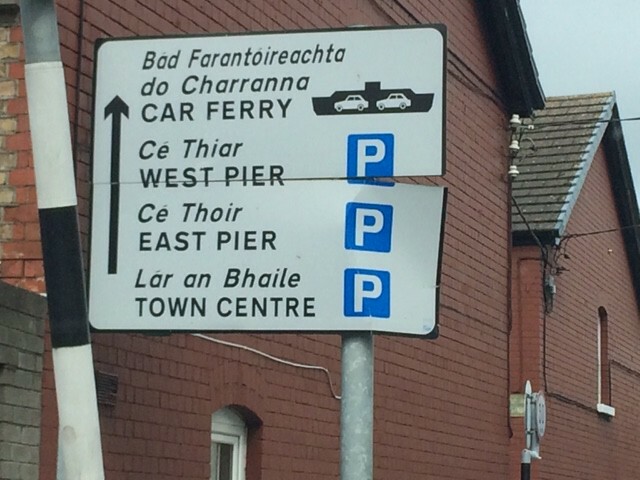 Signs directing people to the non existing ferry are still to be seen. 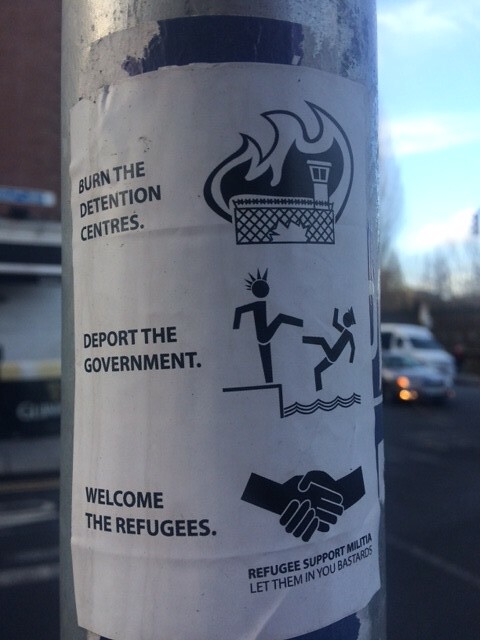 This one is on York road and is one of many. We have a strange relationship with signage in this country. 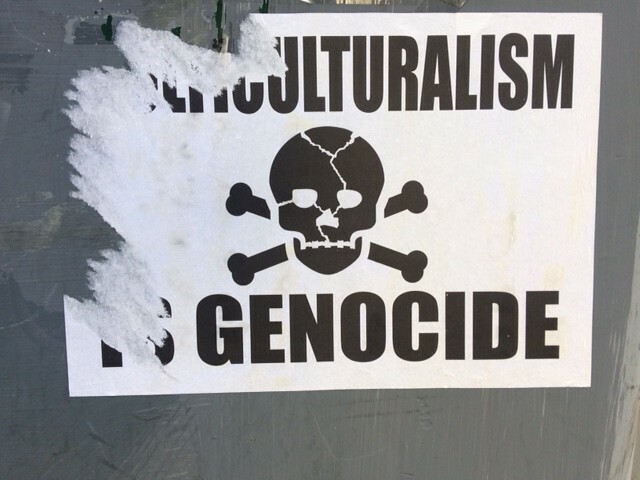 No it is not Genocide but some cultures can get along together and some cultures can not get on together. 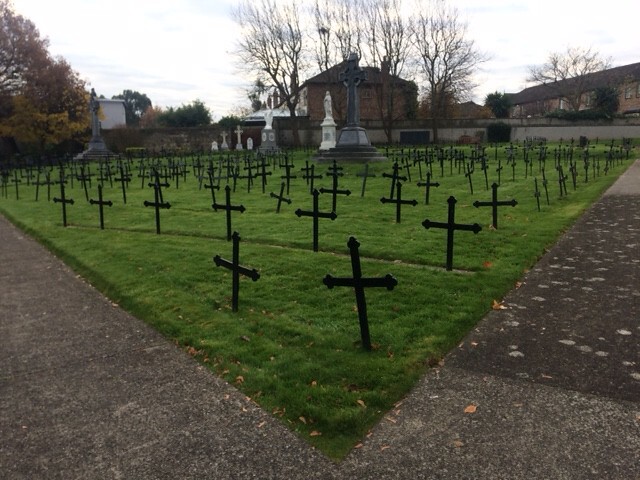 Little known cemetery in Donnybrook. It is the final resting place of hundreds of Sisters of Charity including their founder Mary Aikenhead. Although they are now demonised history will record a more balanced picture of the Nuns. As well as the harm done there was also much good. The self righteous who will allow nothing good to be said about the Nuns should not be so sure how they would have behaved if they had lived in those times. They are all volunteers and all very knowledgeable about all aspects of the Dublin hills (or Dublin "mountains" as we like to call them when not in the company of anyone from the Alps). 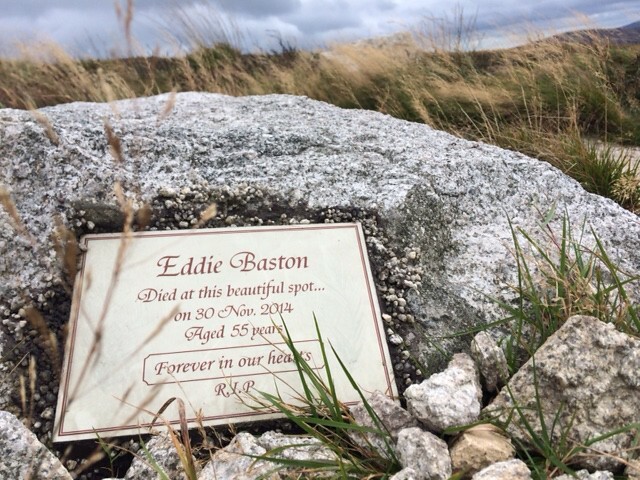 On the same mountain as the phone box was erected is a small discreet plaque remembering a ranger who died from natural causes while on duty and whose ashes were scattered by his widow, escorted by the rangers, on the mountain. If you did not know where to look you would never see it. I only know it is there because I came across one of the rangers chipping away at the rock to make the hole for the plaque to sit into. He had worn out one tungsten chisel and was wearing out a second one. 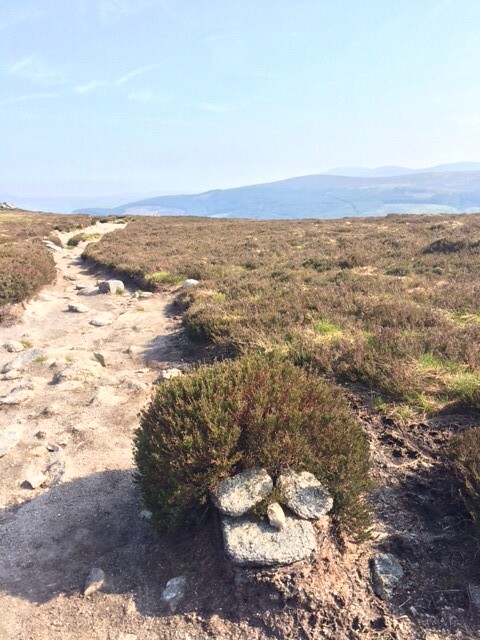 Wicklow/Dublin granite is hard stuff. As I said to him, if I don't ask what you are doing I wont be able to sleep for wondering. He told me about the rangers and his late friend. Bringing able enthusiasts into officially sanctioned organisations seems a great way of putting often retired peoples knowledge, ability and good will to use for the good of society. 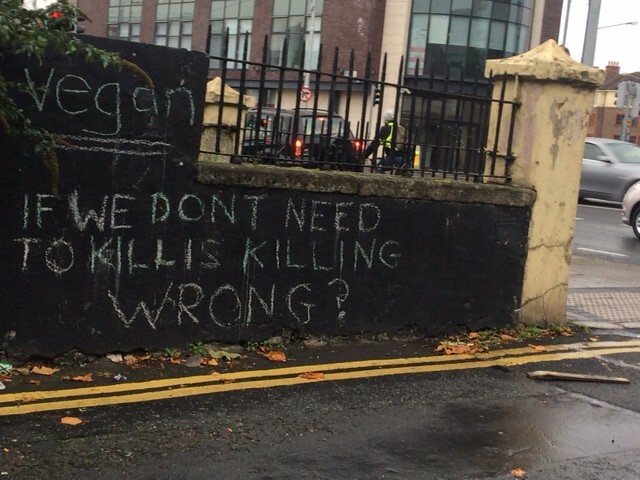 The Vegans are certainly becoming more visible around Dublin. 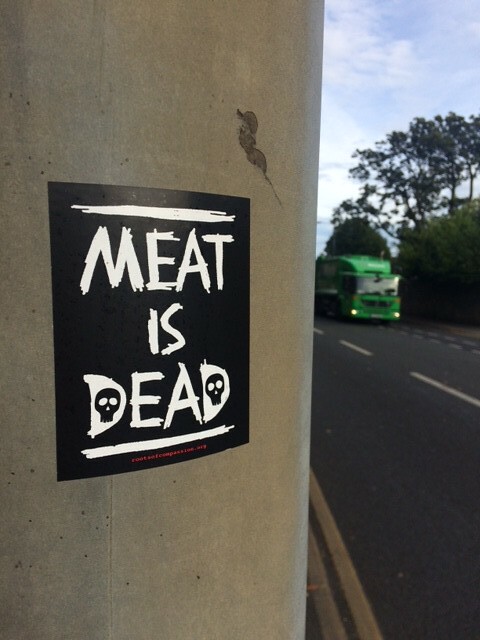 The term ‘vegan’ was coined in England in 1944 by Donald Watson, the founder of the Vegan Society, to mean that “man should live without exploiting animals”. 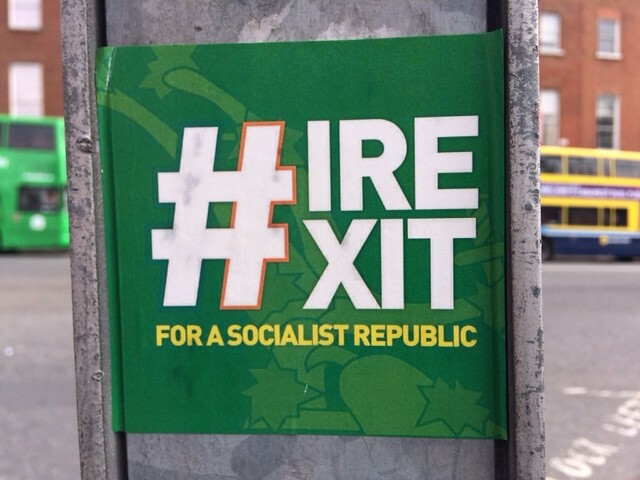 Well we sure have come a long way from An Gorta MÓr. 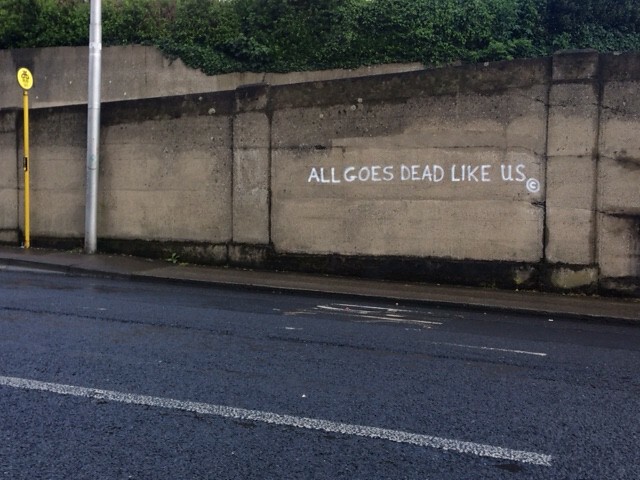 Dun Laoghaire is a poetic sort of place. 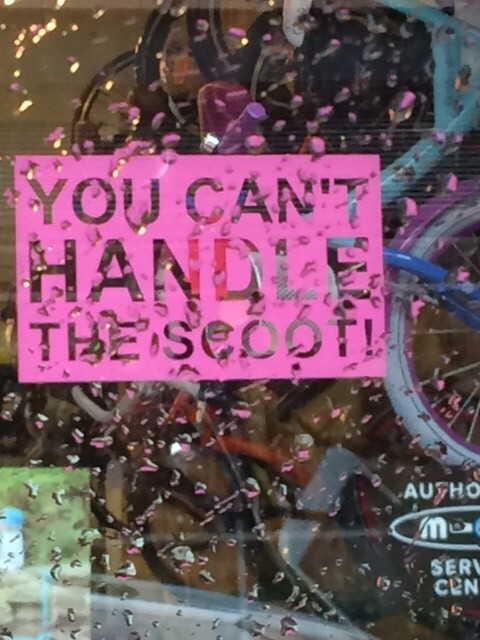 Someone started using the slogan "try poetry". AND then they DID! HO HO HO....Happy Christmas to y'all. On the 'round about before the east-link bridge is Deeks Diner a truck stop in a converted container which in 2008 was named as one of Dublins best Restaurants by The Dubliner magazine. 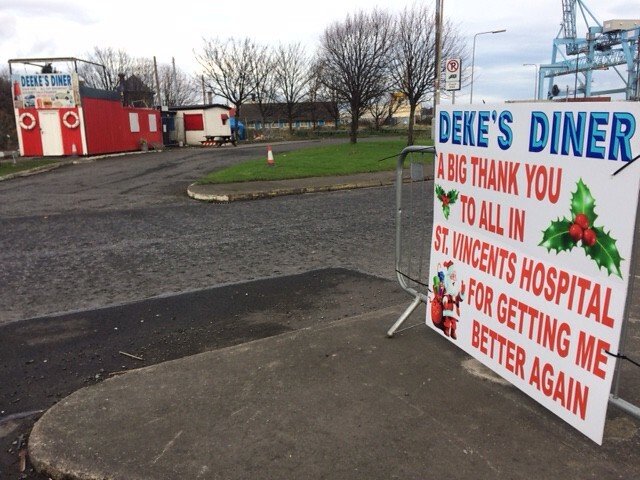 The owner has a festive sign at the roundabout thanking all in St. Vincents Hospital. A nice gesture and a good news story of recovery. The first proposal and the name for what is called a Robin Hood Tax was made in 2001 by the London based charity "War ON Want". It is more wide ranging in scope than the better known "Tobin Tax" proposal. 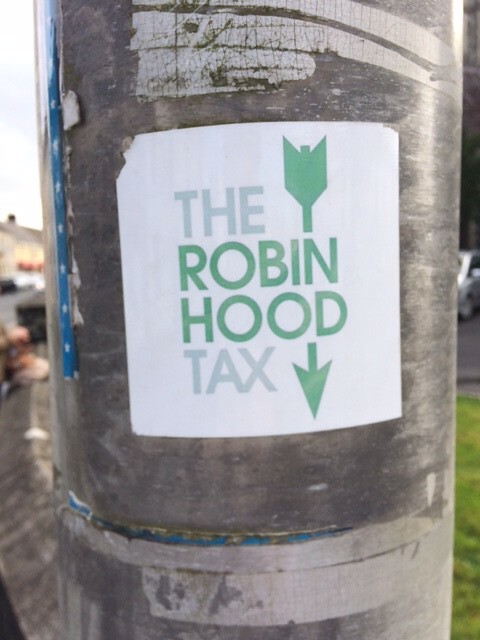 There is also an Irish campaign for a Robin Hood Tax. Here is their Web Site. I am not sure why they thought putting Angela Merkel and François Hollande on their front page was a good idea, but that is what they did. BTW, I like War on Want's slogan: "Poverty Is Political". 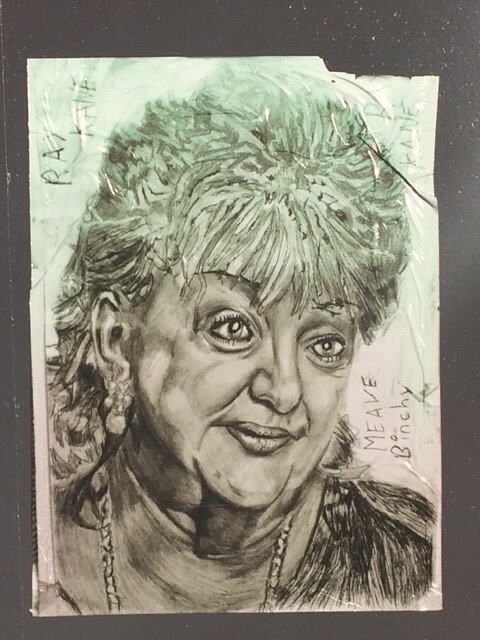 Tribute to the great Maeve Binchy, city center. 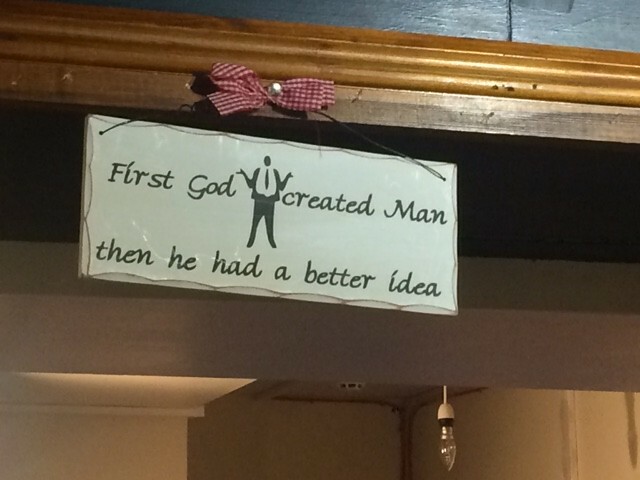 Bar in Wales ran by Women. How they managed without a man I will never know (did not voice that opinion there....discretion is better than valor in my books). Now.....Our traditional Christmas eve trip to the local. Have a peaceful and happy Christmas. 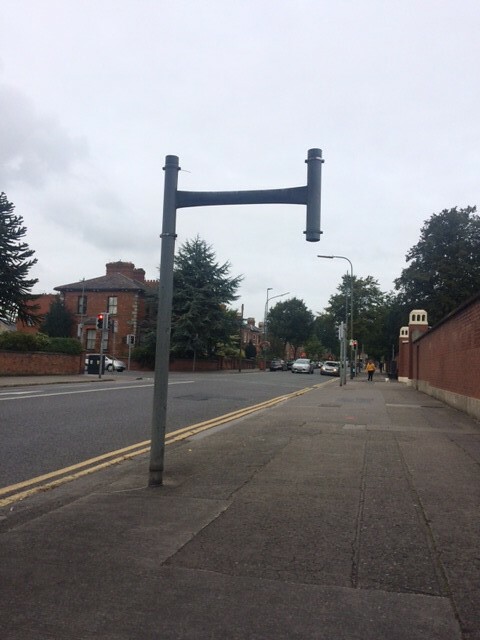 Ever wonder what all the heavy duty poles standing for the most part unused all over Dublin are for? Well they are a legacy of the one and only Owen Keegans time as Dublin City traffic manager. 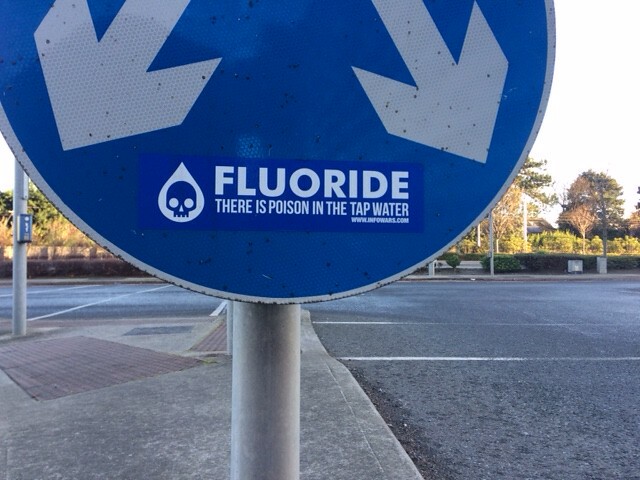 In 2003 new traffic signs were stuck up all around Dublin. At great expense naturally. 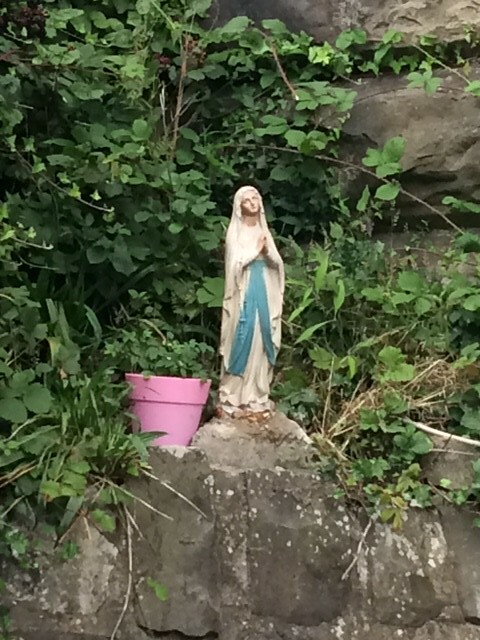 They looked like something you would see on the wall of an Egyptian tomb and were so confusing that it is said some elderly folk ended up in Ballydehob when all they wanted was to visit their grand kids in Bray. In April 2001 in his capacity as city Traffic manager Own Keegan announced the replacement of the city’s traffic signs. New colour coded traffic direction signs for road users were erected under the plan, which aimed to get rid of the confusion experienced by visitors to the city. 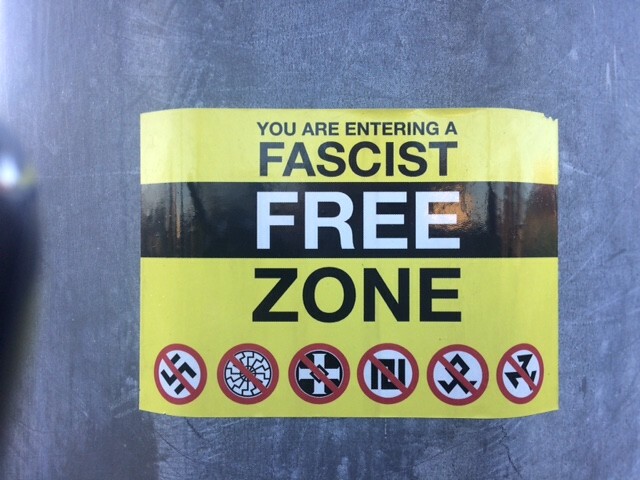 Criticism of the new signs said they were too complex. The 500 new road signs were based on colour coded inner and outer orbital routes – with each junction on the inner and outer orbital routes having a unique code number. 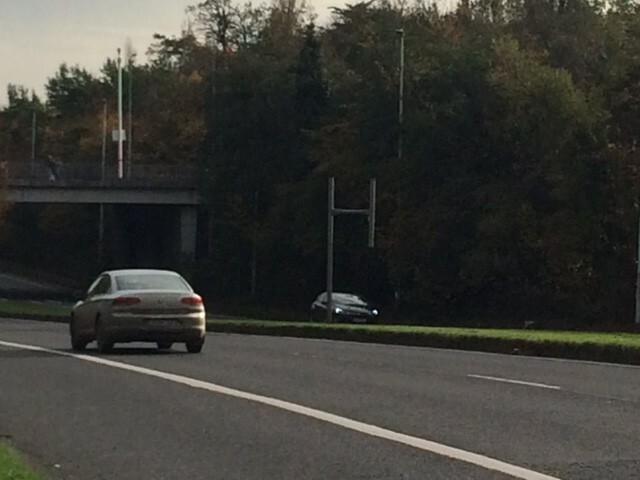 After experiencing the new signs for himself, then Transport Minister Seamus Brennan ordered the signs removed, at a cost of €200,000. 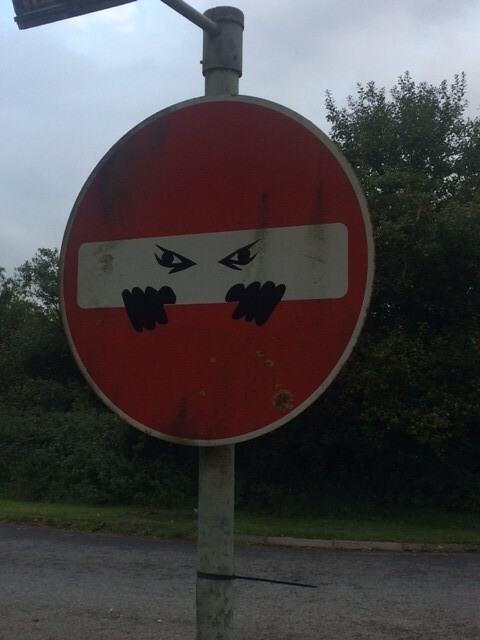 500,000 glossy colour brochures had also been printed to explain the new signs to motorists. 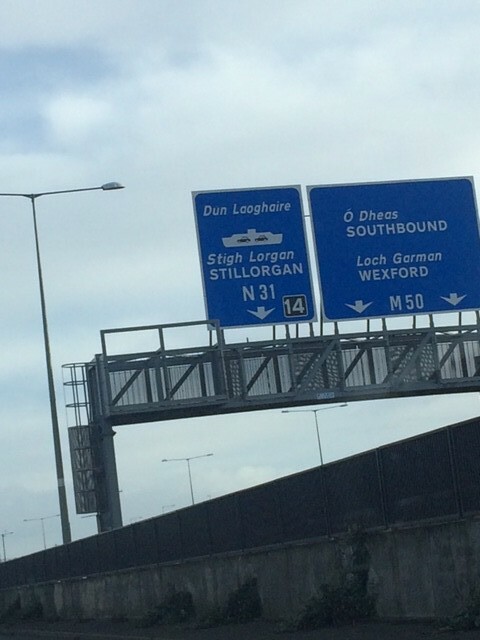 I know I said it before but it really is ridiculous that so many signs, including many on the M50 motorway still indicate a car ferry in Dunlaoghaire several years after it ceased. A couple of weeks after I posted on this thread about a company making carrier bags and other items from the sails of a sunken ship, the Irish Times did a feature article on same company. There have been other interesting coincidences as well. 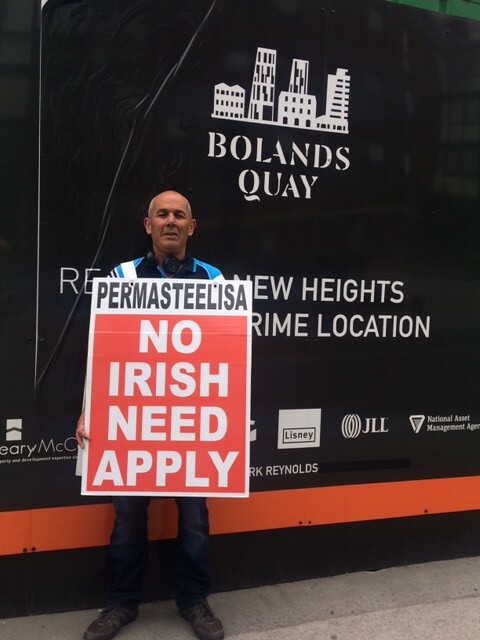 Now Sorcha, wife of Ross O'Carroll-Kelly has suddenly become fluent in Irish (Gaelic language) while Ross is stuck with just one word, bhí. 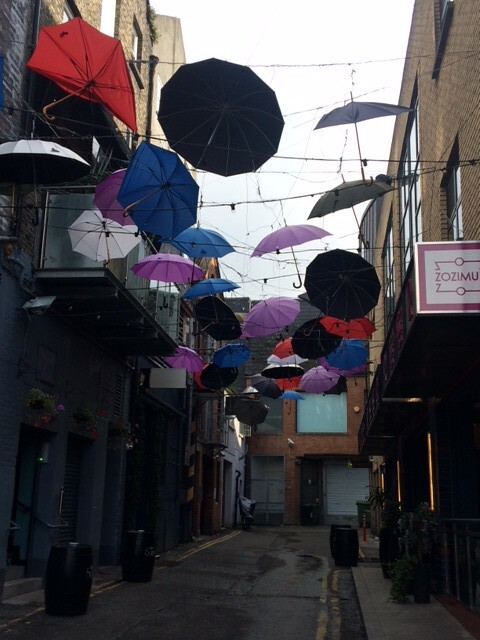 Art installation, laneway off Grafton St. last summer. Munster Simms is an Irish Company founded in 1810. They are now part of the US based Brunswick Corporation but still maintain a strong Irish/Northern Irish identity. Today they are headquartered in Bangor, Co Down and have over the years evolved into "Munster Simms Engineering" better known for their brand name "Whale". They specialise in their own internationally distributed and very well regarded design of marine bilge pump among other products. From around 1900 until the petroleum part of the business was taken over in the late 1960's by National Benzole which was owned by Shell petroleum they were the main Irish company distributing oil products. I have read (but now cannot find the source) that at their height they had over 400 petrol stations all over Ireland. According to the book Sean Lemass: Democratic Dictator by By Bryce Evans Seán Lemass and his right hand man John Leydon gave Munster Simms protection from been taken over by the giant petrol companys on the understanding that they would employ local people and source, where possible, all their supplys in Ireland. Today very few people remember Munster Simms but if you know where to look you can still see the ghosts of the long gone garages. Maybe because of their engineering connection or maybe it was part of their ethos, they often (maybe always) put up very strong, built-to-last metal poles from which to display their MS sign. 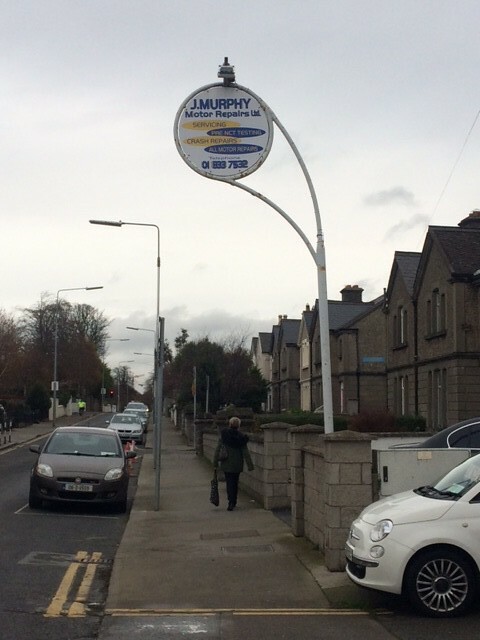 And these same poles, ladies and gentlemen, is why Munster Simms earns a place on the Lampposts thread. 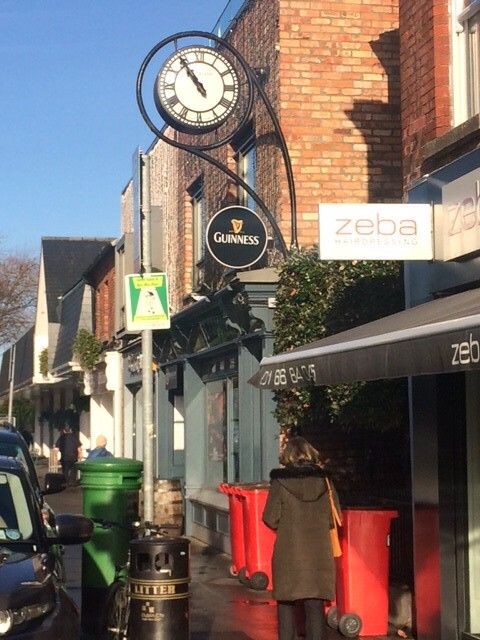 Mulligans pub in Sandymount village occupies the place where Jacksons garage once did business. The garage is long gone but the pole which once held the MS sign now holds the Mulligans clock. 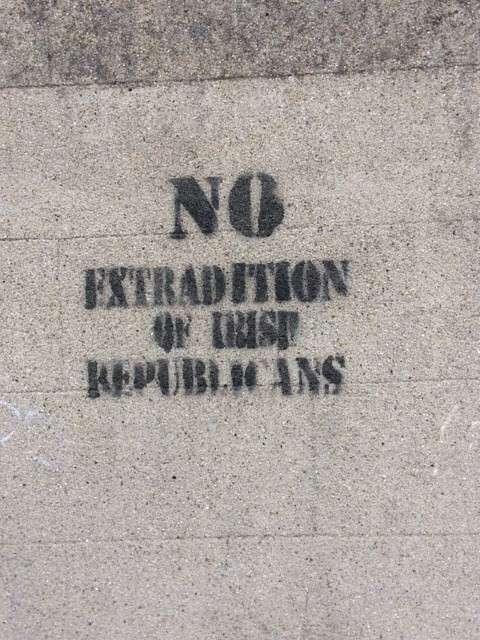 Vernon Ave. Clontarf. I don't yet know as much about this old MS garage but am working on it. If anyone knows more about the history of Munster Simms or can say where their garages were or if you spot any other of these old poles please let me know. 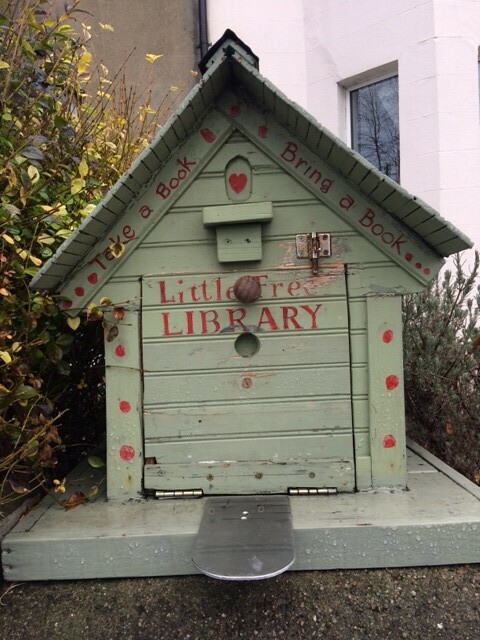 Got to be the smallest library in the world. 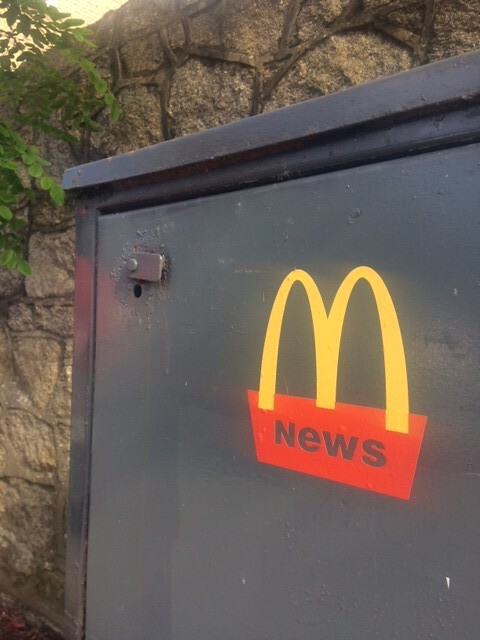 Fixed to a garden wall accessible to all passers by in Bray, Co Wicklow. 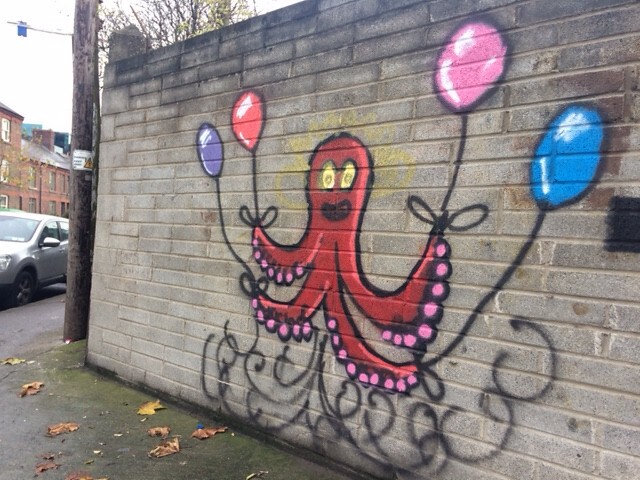 Monkstown Farm Dunlaoghaire. 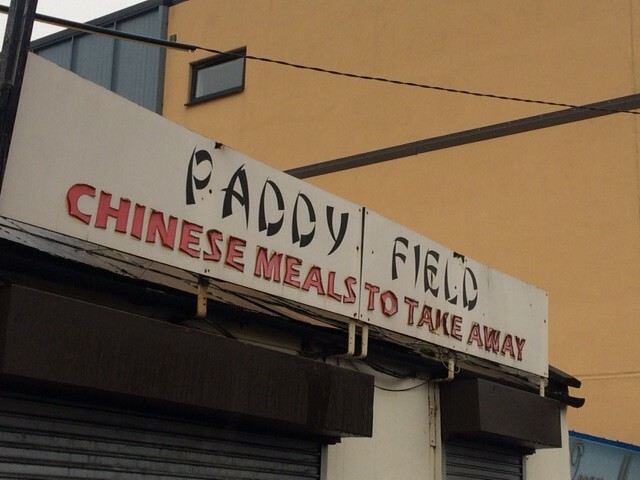 It is closed now but this Chinese Takeaway had one funny name. 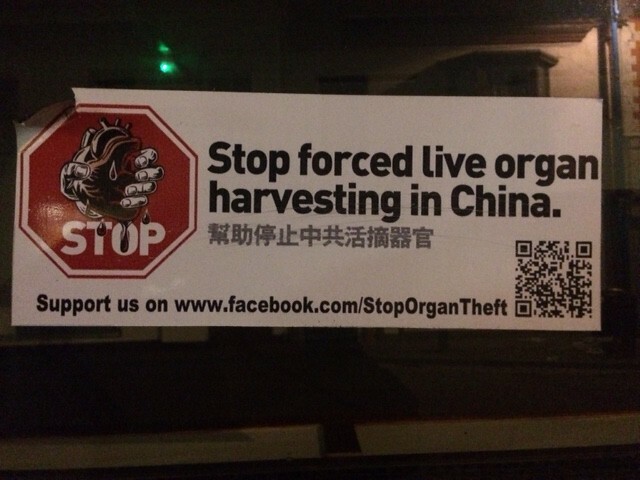 There is extensive evidence suggesting that hundreds of thousands of Falun Gong practitioners have been killed for their organs in China. And the crime is still going on. 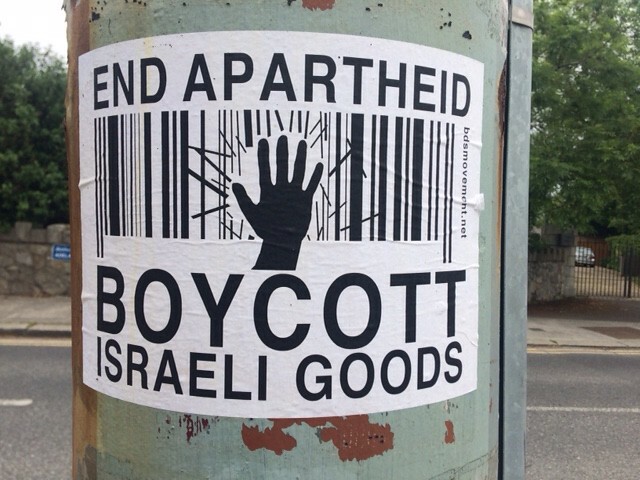 Help save innocent lives and end this crime against humanity. 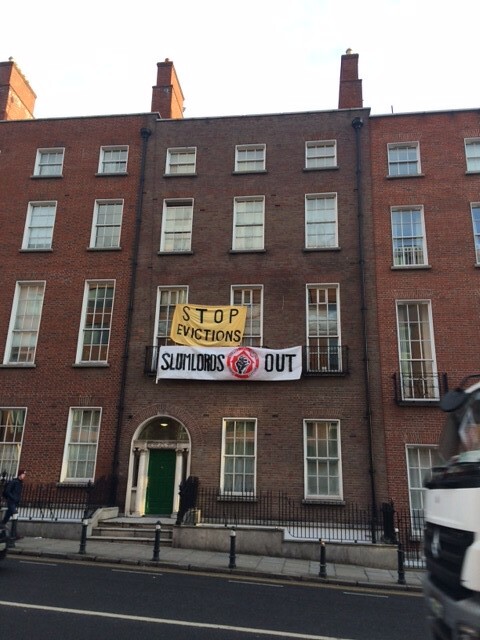 Falun Gong members protest every day outside the Chinese embassy on Merrion Road, Dublin 4. Sometimes one or two people, sometimes many more. Nasau St, from the "Refugee Support Militia". Very very secret organisation operating out of their parents house for security reasons. Membership two. St Govan,s shopping center Pembroke, Wales. Because as everyone knows, happiness increases in direct proportion to the amount of stuff we can buy. 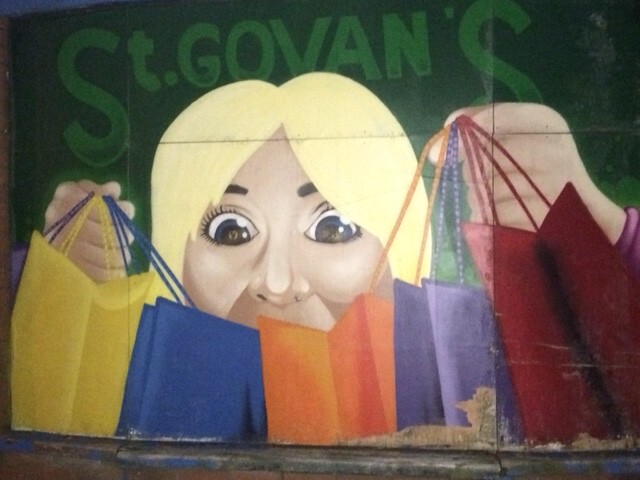 It is all the more ironic as St Govan was a hermit monk, maybe from Ireland. There is a small chapel built into the cliffs along the Pembroke coast where he is said to have lived. 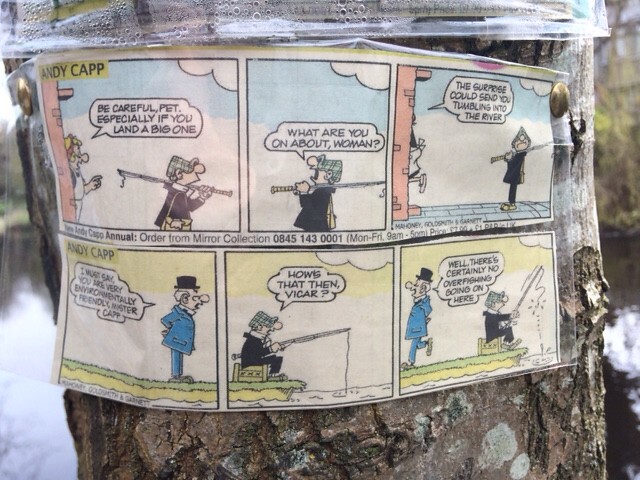 Along the Dodder river where anglers give testimony of the triumph of hope over experience someone has decided to share the wit and wisdom of Andy Capp. I watch very little telly and have not seen any of the debates but I gather Maria Steen is one of the "NO" sides best debaters. Seems she was banned by RTE (national TV) because she had appeared on a previous debate (and from what I read she preformed outstandingly). 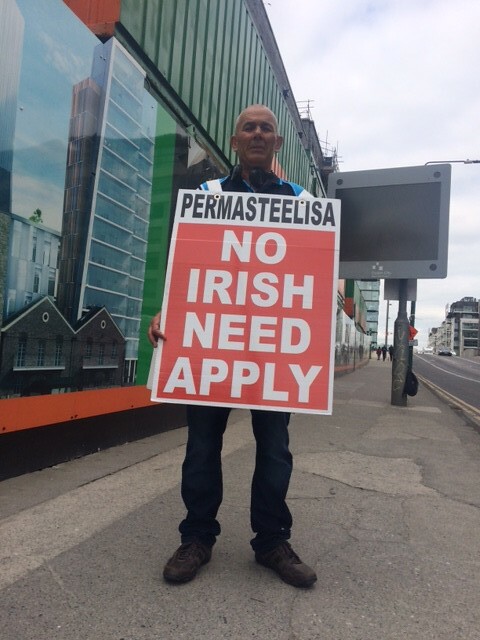 This despite some representatives on the "YES" being allowed to appear repeatedly. 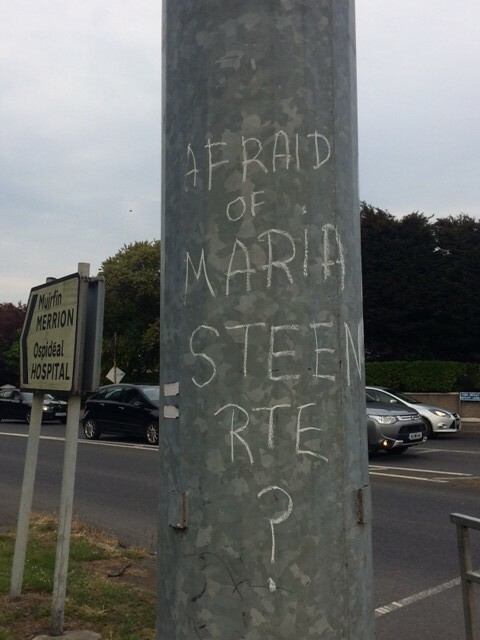 Someone has taken exception to this and has said so on many of the lampposts around RTE's HQ in Donnybrook. 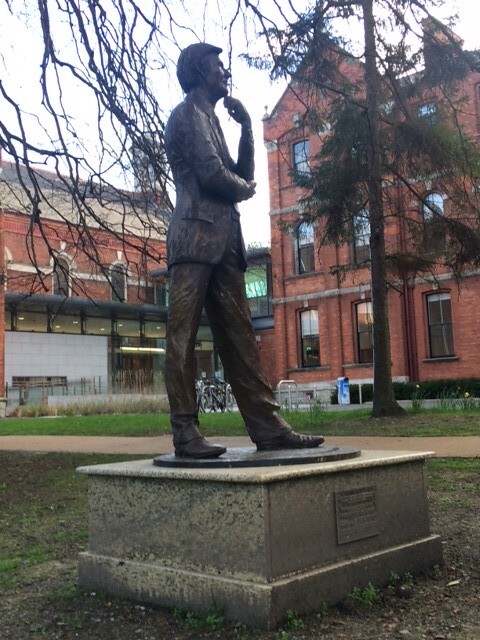 Michael Smurfit as I am sure we all know is second only to Bono in his humility and modesty. But what many are not aware of is his mischievous sense of humour. 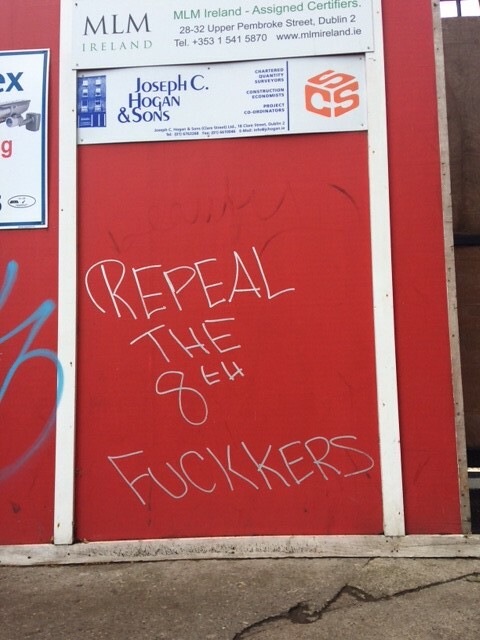 This fun side to Mikey Smurf was evident when he plonked the hideous floozy in the jacuzzi in the middle of O'Connell St. The joke only became apparent when halloween rolled around and the people enjoyed a great chuckle at the wit and cleverness of one of our most loved and respected fellow citisens. His self-deprecating humor was again in evidence at the launch last week of his new book, all about himself, and titled "a life worth living". 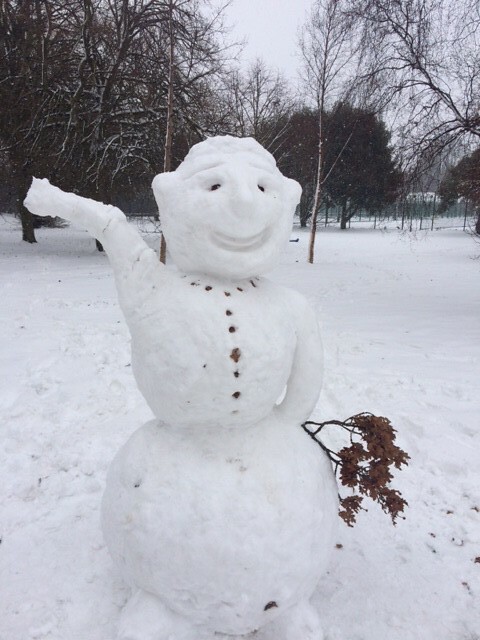 As a gag to entertain the guests he pretended to be an egotistical pratt and festooned the driveway of Smurfit College where the launch was taking place with picture posters of himself. There was even pictures of the Smurf on either side of the red carpet. He will do anything for a laugh. What a guy. Well what do ya know, the great guy has decided to permatise (is that a word?) the joke by placing a statue of himself in a sort of Charley Chaplin pose on a granite plinth looking comically smug.....HA HA HA...what a guy.....as if he ever would look smug in real life. 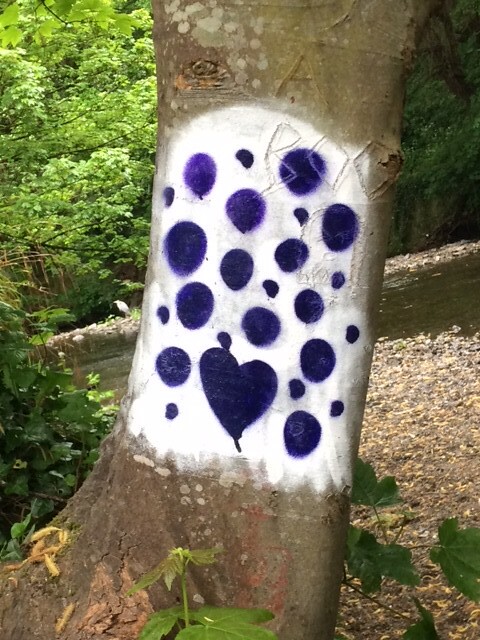 Down by the Dodder river an anonymous artist left this expression of love.